It’s a typical Monday in this dusty New Mexico town 30 miles north of the U.S.-Mexico border. In a brightly lit classroom at Deming High School, Francisco Manuel Garcia Ruiz, a math teacher recruited from Spain, speaks in rapid Spanish to a group of sophomores. In a room across campus, Annabelle Carbajal, the district’s migrant student coordinator, looks out at the faces of students whose parents work in the nearby fields, telling them she’s there to help. Down the hall, Nadia Leaños, 14, sits with her older sister in the back row of a pre-engineering classroom. Leaños’ day starts at 4:30 a.m., when a driver picks her up, along with several other children from their homes outside Palomas, Mexico, and drops them at the U.S. border. She’s one of the roughly 800 students that Deming Public Schools buses from the Mexican border each day. Many of them are U.S. citizens; some are children of deported parents. All are eager for a better education in the U.S.
Luna County is emblematic of what the rest of the rural West could face if minority growth continues apace. A generation ago, this historically military and ranching community was two-thirds white. Today, two-thirds are Hispanic and just a third are white. If it weren’t for the growth in minority and foreign-born people in Luna County, the population here would have decreased over the past 40 years, according to research by Bozeman-based Headwaters Economics. The county is also exemplary because these demographic shifts have translated into job growth, with big gains in construction and manufacturing. Over time, the community has responded to the surge in immigrants and other minorities by adding Spanish dual language programs to its schools, with the hope of preparing students for a competitive international economy. The schools today also heavily recruit children of migrants. But the picture in Luna County isn’t all rosy. Spanish language programs receive pushback from those who don’t think biliteracy is an asset. Some U.S. cities have launched welcoming campaigns for immigrants settling into their communities – not Luna County. This community’s story is less a tale of an organized effort than it is the outcome of a few committed individuals who, over time, shaped the future of their town and of the immigrants who came after them. Immigrant entrepreneurs made a place for themselves in Luna County, and others forged political inroads that future generations followed. Building a community and economy across diverse factions in Luna County has been long and fraught, but today people here point to a few specific efforts that made a difference. Deming High School teacher Omar Zamundo, from Mexico, teaches a dual language psychology course. The town of Deming began as a railroad stop that eventually became the last link in a transcontinental railroad in 1881. Several military training camps launched in the early years of World War I shaped the town, too, bringing tens of thousands of military personnel to Luna County. Street names in Deming today reflect the region’s flirtations with mining and refining: Copper Street, Gold Avenue, Lead Street. But arguably the biggest influence on Luna County’s makeup was the Bracero Program, the nation’s largest experiment with foreign workers that brought hundreds of thousands of immigrants into U.S. fields to meet U.S. food supply needs during World War II. Estimates vary, but between 1942 and 1964, the program, called bracero after the Spanish word for laborer, brought as many as 4.6 million Mexican farmworkers into the U.S. and accounted for substantial immigration to Luna County. Many of the families stayed, following at first the promise of jobs, then planting roots in the social, political and economic soil of the community. The program forced diversity into Luna County, and that growth in minorities has continued. Population has nearly doubled since 1980, with most of that coming from a boom in people of Hispanic origin, from about 6,100 in 1980 to 15,900 in 2015, and in people who are foreign-born, from 1,400 in 1980 to 4,200 in 2015, according to U.S. Census data. Luna County illustrates a trend sweeping the rural West, where almost every county is more diverse today than it was a generation ago. Such growth in minorities helps sustain businesses and keep schools open, according to an analysis by Headwaters Economics. That’s certainly the case in Luna County, where jobs have grown more than 10 percent in the past decade, with big gains in construction, retail and government, and where a local green chile processing plant now employs up to 900 people during harvest season. Economists point to a number of factors to explain rural economic development, from proximity to natural resources and urban markets to a town’s ability to encourage entrepreneurial risk. But some researchers chart a clear line between cultural diversity and economic development, arguing that cultural rigidity can make towns unable to adopt new technologies or improvements. Culturally diverse places, on the other hand, may be more able to adapt. A handful of enterprising immigrants in Luna County have shown how adaptation, though time-consuming, can happen. 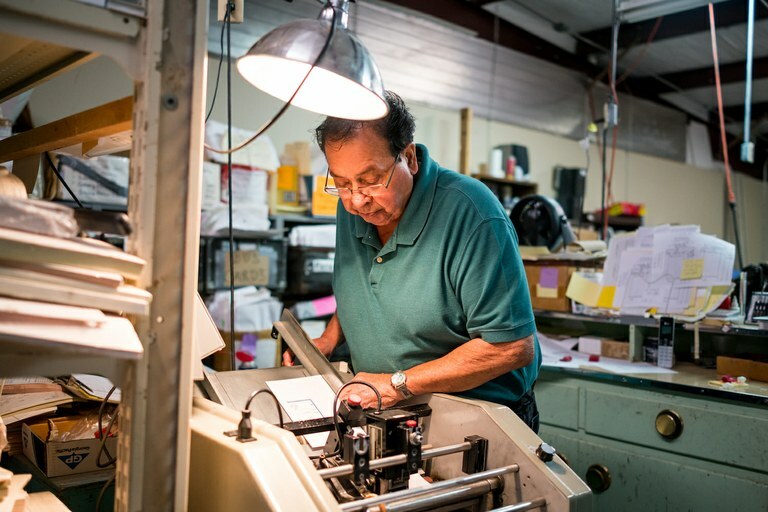 Deming City Councilman and J and J Printing owner Joe "Butter" Milo measures and cuts card stock for customers. Milo’s parents were first-generation immigrants from Mexico. 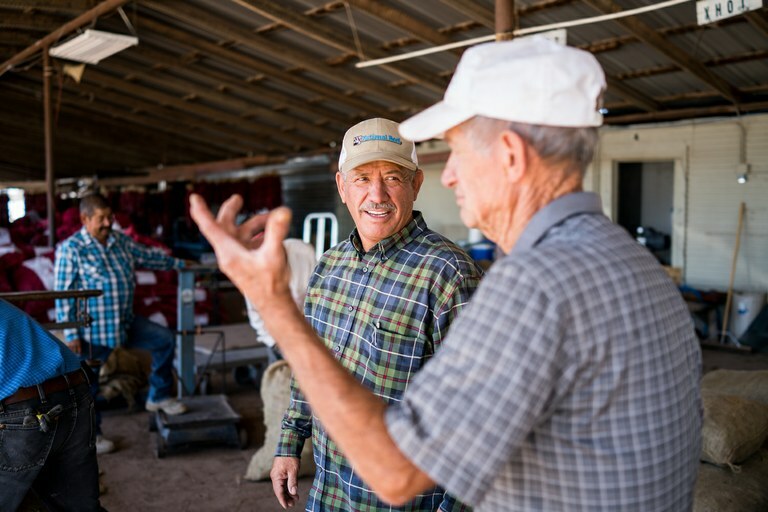 Of the scores of workers that traveled to New Mexico’s fields during the Bracero Program, several managed to thread themselves into the economic and political fabric of the Deming community, laying political inroads and starting businesses that are still thriving today. Eddie Diaz, 58, comes from one of those families. Diaz and his family built one of the state’s biggest chile-growing operations on 1,600 acres of Luna County land, fueled by a combination of their father’s work ethic and their mother’s humility, Diaz said. His older brother, a school board member and county commissioner, is the only Diaz who got political, Eddie said. Eddie stuck to the land, and today employs 15 people year round and dozens more during harvest season. From the start, his family noticed a cultural divide in Luna County, he said. Across town, Joe “Butter” Milo, 74, a city councilman and, like Diaz, the son of a Mexican immigrant, hangs an American flag outside the door of his printing shop in Deming. Milo’s father worked on the railroads in and around Deming and eventually bought a house in town, where he raised 12 children. On Sundays, Milo and the other neighborhood kids would crouch low outside a neighbor’s house, looking through the window his neighbor would open so Milo and his friends could watch “The Ed Sullivan Show” on one of two televisions in the neighborhood. Still, Milo says, “I was lucky.” The teachers took an interest in him. “For me, without them, I don’t think I really could have become a good student, a good citizen.” Few, if any, teachers spoke Spanish, according to several Deming residents who graduated from local schools. They would teach Milo the lessons first, then ask him to teach his peers in Spanish. He remembers bringing tortillas into the classroom, and cutting them into slices to teach fractions to his classmates – a far cry from teachers now recruited from Mexico and Spain to offer instruction in Spanish. How Milo went from not speaking English to being a small business owner, a member of the local Rotary Club and city official in a town where a street sign now bears his family name is an important trajectory to understand, because it’s one relatively few descendants of the Bracero Program have managed to attain. Milo states his mission mildly: “(Our parents’) deal was to work and feed their kids... As I grew older I got to realize, who is representing us? We were here, and we weren’t all selling tacos out of a little wagon.” Milo started as an activist, advocating for better roads and parks in the neighborhood where he grew up and other low-income parts of town. His decades of work in local government have laid inroads for others behind him. The city’s current mayor is Hispanic, from the same neighborhood where Milo grew up; Milo’s son was a county commissioner. But Luna County Commissioner Linda Smrkovsky describes how, when she grew up, immigrants were separated in life, if not in law. “When I was in school, the school bus stopped right in front of our house to bus all the Anglo kids to Smith School,” Smrkovsky said. But her grandfather, who was white and had donated the land for what became a mostly Hispanic school nearby, didn’t want his kids bussed across town to the mostly white school. The school next door was good enough, Smrkovsky remembered her grandfather saying. Smrkovsky has long worked to create opportunities for immigrants in Luna County, first as a health care administrator helping first-and second-generation immigrants apply for jobs, and now as a public official. There’s still a tension, Smrkovsky said, between those in town who see immigrants as solely a strain on social services, as uninsured clients filling their hospitals or as a burden on taxpayers who support their education, and those who see them as the bedrock of the local workforce. Eddie Diaz, the son of a Mexican bracero, talks with a customer about this year’s green chile crop at the Diaz Farms store, in Deming. In a way, the local schools reflect the community’s shifting attitudes toward immigrants. Deming didn’t volunteer to start dual language programs, for instance. Classes started after the U.S. Department of Education demanded the district serve its Spanish-speaking students better in the mid-1990s, said Michael Chavez, a Deming native who now oversees dual language instruction at Deming Public Schools. Today, roughly 1,500 students participate, nearly a third of the whole district. Nationwide, dual language programs have grown over the past decade, buoyed by research that suggests cognitive benefits to being bilingual. In the 2012-13 school year, an estimated 39 states and Washington, D.C., offered at least one dual language program, according to a 2015 federal report . New Mexico, the state with the nation’s highest percentage of Hispanic residents and one of just five majority-minority states, has supported dual language education since about 1995, when the state launched five pilot dual language programs. Today, the state reports 132 dual language programs across the state’s roughly 900 public and charter schools. At first, Deming’s schools aimed to move students into full-time English classrooms as quickly as possible. Today, the goal is to help students become and stay fluent in both languages, so instruction is often half in English, half in Spanish, through high school, including some advanced classes. Though the district overall is ranked a “D” on the state education department report card, data from Deming’s annual assessment suggest that dual language students are an exception; once students are truly bilingual, they consistently outperform their peers who aren’t enrolled in dual language classes. Most native English speakers drop out of dual language classes before high school, Chavez said, partly because some parents fear instruction in Spanish is a watered-down version of an education. Some Spanish-speaking parents opt out, too, believing their kids need to learn English as fast as possible and instruction in Spanish holds them back. Some skepticism may be rooted more in stigma than in academic concerns; Chavez said a parent once explained they’d feel differently about the program if the second language were French, instead of Spanish. Luna County is not the only place where bilingual programs face stigma and skepticism. In the late 1990s, California voters effectively eliminated bilingual education in that state, a move some said was driven by unease over the state’s immigrant makeup. Voters reversed that decision in 2016. In an attempt to combat such stigma, Deming Public Schools started offering students the chance to earn a seal of biliteracy before the rest of the state did. The district has plans to host parent discussion groups and screen a documentary about the cognitive benefits of dual language programs. 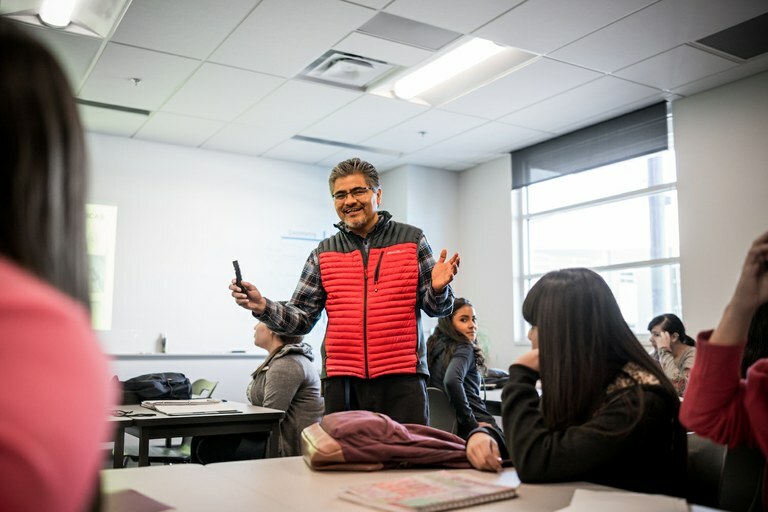 Chavez is talking with a nearby community college about a partnership between his district’s dual language programs and the college’s international business program. He hopes to make an economic argument for why reading and writing in multiple languages matters. 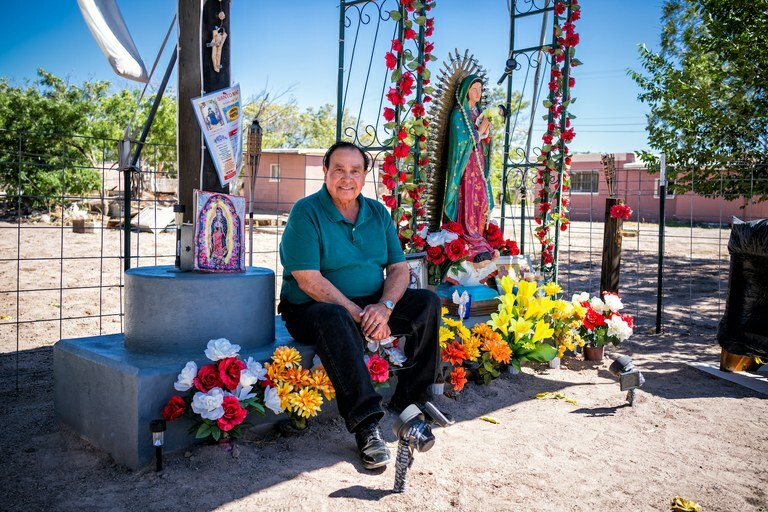 City Councilman Joe "Butter" Milo sits by a memorial to lost immigrants he built in Deming. If there’s a takeaway from Luna County’s journey, it’s that building a cohesive community across diverse factions takes time, and that outside forces sometimes shape the process as much as internal ones. Local schools are a force in the process, too, and schools here have decided their education should match the makeup of the community. The community has also recognized the value of its immigrant entrepreneurs, like Milo and Diaz. Today, Diaz switches easily between Spanish and English at his farm’s store, which each fall is piled high with watermelons and onions, and where the air burns with the smell of flame-roasted chiles. Diaz’s parents were grand marshals at the local fair this year, and rode in a car near the front of the parade.